So clearly the, quote, unquote, deep state is resisting all legitimate efforts and requests and demands to produce evidence that would explain what’s going on here. What instructions did Mueller actually get? What are his instructions? What are the charges he was given? Under what auspices is Mueller operating? And Rosenstein will not turn it over. Trump could force that if he wanted to. Trump could force the release of all kinds of things. But now they’re trying to basically claim that the president of the United States exercising his constitutional duties is obstructing justice. Do you realize, folks, how infuriating that is? These people are literally trying to upend the United States Constitution, to subvert it or to go around it, and they’re attempting to establish that the president, by firing Comey, has obstructed justice. 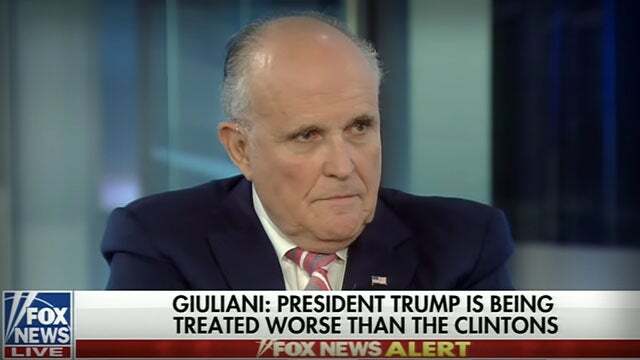 One of the things Rudy said last night in his interview is that Mueller’s whole case, as far as Rudy has been able to ascertain, that Mueller’s whole case is Comey! That Mueller has thrown all of his eggs on the obstruction charges in with Comey! That Comey’s unassailable, in Mueller’s eyes. For crying out loud, if Comey is the case, then Mueller is relying on somebody who has been seriously charged with lying a number of times. You know, we’ve learned a lot about Comey’s initial answers when his book tour began. For example, let’s revisit this from yesterday’s program. When Comey was being interviewed by George Stephanopoulos, remember when Stephanopoulos asked Comey if he told Trump that the dossier was written and paid for with money from the Clinton campaign? And Comey said, “No. That was not my goal.” That kind of zoomed past me when I first heard it, I said, “That doesn’t make any sense.” I focused on the fact that, to Comey, the fact that Hillary wrote the thing didn’t seem of interest and didn’t tell Trump about? Well, we now know what those answers mean. His assignment came from James Clapper, Obama’s Director of National Intelligence. The assignment was to tell Trump about the dossier. That was it. Not where it came from, not who’s it was, just tell him about it. That was Comey’s goal. That was his assignment. Because once Comey told Trump, then CNN had a news hook, CNN had a reason to report it. Clapper then called CNN and told CNN that the FBI director had just informed the president-elect about the dossier. Three days later, four days later, January 10th, CNN runs this massive story about the dossier, including the golden showers. They get an award for that last Saturday night at the White House Correspondents’ Dinner. James Clapper and John Brennan, CIA, arranged this whole thing. Shortly after the January 10th running of the story, CNN then hires Clapper! So essentially Clapper was paid by CNN to get that dossier in the news by having Comey tell Trump about it. This is, according to Rudy, this and other things are Mueller’s case, that firing Comey is the obstruction? Then we get these questions from yesterday that Mueller wants to know what Trump was thinking. So if Comey is the bulk of Mueller’s case, then Mueller is not the bright guy that we’ve all been told he is. Any responsible investigator would realize Comey’s damaged goods now, especially writing about all this in the book. 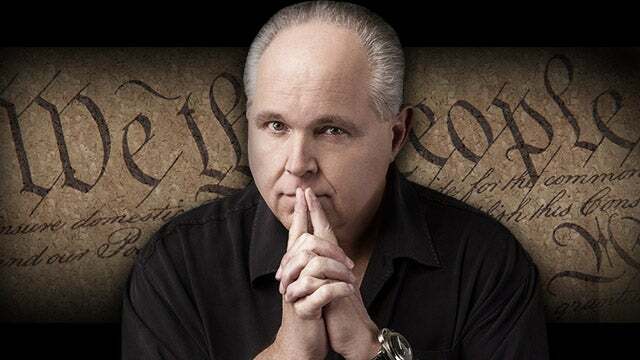 RUSH: Fox has some little guy — I think they do this on purpose. I don’t know this little guy’s name. He’s bald. He’s of slight build, shall we say, have no idea what his name is, and he’s on as a, quote, unquote, Democrat strategist or analyst. And this guy is a joke. He’s earnest and he’s enthusiastic, and he doesn’t know what he’s talking about. He is a partisan rat. Meaning that he’s down there in the gutter with this stuff. And he was on with Jason Chaffetz yesterday. I watched a little bit, this was during commercial break, and this guy, Chaffetz was looking at him like, “Who are you? Why are you here?” And this guy obviously thinks a lot of himself. Every time he makes a point, he thinks everybody should be speechless with its brilliance. But he was trying to tell everybody that Donald Trump is guilty of obstruction because Donald Trump said that he was firing James Comey to stop the investigation! Well, I’m sorry, but Donald Trump knew that the investigation wasn’t gonna be stopped by firing Comey. Just like it wouldn’t be stopped if he fired Mueller. They’d just replace Comey, then they just replace Mueller, if that were to happen. And Trump never said it. Trump never said he was trying to stop the investigation. The reason Trump fired Comey — does anybody remember? Do any of you remember what the given reason was why Trump fired Comey? Well, he couldn’t trust him because Comey would not publicly say what he had told Trump privately! He had told Trump privately three times he was not a target. And Trump said, “I want you to tell people this publicly if you’re telling me,” and Comey wouldn’t do it. And in Trump’s letter announcing he was firing Comey, remember, he made reference, “Even though you have told me three different times I am not a target.” That’s the first we ever knew that Comey was telling Trump he wasn’t a target. But Trump also fired Comey because it was the recommendation of Rosenstein, folks! Rosenstein wrote a letter recommending that Comey be fired for a whole bunch of professional reasons. But at no time did Donald Trump ever say that he was going to stop the investigation by firing Comey! And yet here’s this little guy on Fox just ranting on and on and on about it and that that means that Trump is guilty of obstruction. Trump is not guilty of obstruction. He has the right to fire the FBI director. And these people are trying to turn Trump engaging in constitutional duties as criminal, obstruction of justice. There’s something that I don’t know if anybody is thinking about. I’m sure somebody is somewhere, but everything Mueller is doing here, everything this investigation is doing, it doesn’t just stop with Trump. You know, whatever precedents are set here and whatever boundaries are broken and whatever new territory is staked out by the intelligence communities and law enforcement is gonna have a forever impact on the presidency. So whatever these people get away with in investigating Trump and in their minds hopefully throwing him out of office, whoever follows in Trump’s footsteps is going to have to deal with those same precedents. And there is a precedent being set here, there is a process underway by which the president of the United States is being established as being subordinate to the intelligence community and the Department of Justice. Because if you watch this, if you land from Mars and you turn on TV and start watching this, you’re gonna conclude that the most powerful person in the country is Robert Mueller and that the president of the United States serves at the pleasure of Robert Mueller. And if Robert Mueller decides that he doesn’t want Trump to be president, then Trump’s not gonna be. And, I’m sorry, but that is not the case! No special counsel has anywhere near the power of the president of the United States, in terms of the Constitution or any other structure. And neither does the deputy attorney general or the attorney general. The president is the executive branch, and everybody there serves at his pleasure. But these people are setting it up that if they succeed in getting rid of Trump, then every president thereafter is going to be seen in terms of legal precedent subordinate to, in this case the intelligence community and the DOJ because they’re the ones running this show and acting like the president is beneath them, underneath them, however in the power structure of things. The Constitution is being reconfigured here, and depending on how this ends, it is going to have precedent setting aspects for the office of the presidency as well. RUSH: By the way, I want to reemphasize something. You land here from Mars, and you turn on any news network, you know what you’re gonna think? You’re gonna think that there’s this person whose job is to investigate the president every day and that this person is responsible for if presidents stay in office or not. That’s what you’re gonna think. And you’re gonna think, in this case if you just land from Mars, it’s Robert Mueller. And you’re gonna think it is a feature of American government, that there’s some guy who has the overall power and ability to determine whether or not presidents of the United States stay in office. We have here something called the independent or special counsel law that needs to be done away with, precisely for this reason. Well, and there are many others. And I would maintain that you don’t have to land here from Mars to think that. All you have to be is an average American low-information voter, and you pay attention now and then, you might think that there is a permanent overseer. That there is a permanent, never-ending investigation of the president and that this person determines whether or not the president should stay in office. That’s what this has become. And there’s no end in sight to it. They keep trying to invent crimes, manufacture instances of crime, usually process crimes and lying.